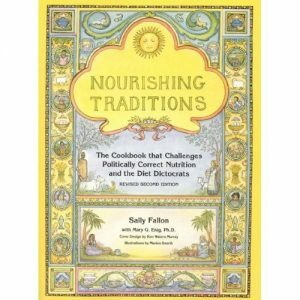 Nourishing Traditions by Sally Fallon is one book that helped me understand the relationship between food and our bodies, and the importance of protecting our freedom to choose foods produced with more than financial profits in mind. Sometimes it seems like certain books find their way to me as a direct answer to my prayers. Nourishing Traditions answered my prayers for answers about nutrition, food choices, preparation, and health. I’ve been on a nutrition journey for over 12 years due to my youngest son’s diagnosis of “severe autism.” Jake’s diagnosis was an umbrella term for his extreme hyperactivity, chronic ear infections, eczema, sleep issues, digestive issues such as food allergies and dysbiosis, extreme sensory issues (i.e. acted as if deaf), minimal social and language development, and almost non-existent attention span. The “food” connections in his puzzle became clearly evident as I began experimenting, not through the advice of his doctor, but as a result of what I found out through books. Jake was breastfed, and when I removed dairy from my diet the oozing, red inflamed patches on his cheeks cleared up within a few days! The doctor had told me that his eczema was “extremely dry skin”…why hadn’t they mentioned a possible food connection? Later, as his diet began including more solid foods, I decided to try taking wheat out of his diet. Much to my delight, his chronic ear infections finally cleared up! Though his eczema and ear infections had thankfully left the picture, so many of his other significant challenges persisted, and I knew I had just scratched the surface. I used to think a frozen waffle popped in the toaster with some squeeze bottle maple-flavored corn syrup was a hot breakfast. What I was discovering through books wasn’t easy to integrate with what seemed culturally “normal” to me. I kept reading, learning, trying different diets – the gluten free/casein free diet, the Specific Carbohydrate Diet, the Body Ecology Diet, the anti-yeast diet, the food rotation diet. If there was a possibility that it might help, I wanted to try it! It was all so confusing because sometimes the information was conflicting especially in regards to meat, grains, legumes, nuts, dairy, and fruit. Almost all allowed for vegetables, but a growing boy that spent each day in non-stop motion needed more than baby carrots! I thank the book Nourishing Traditions for putting an end to the madness. Fallon shares the findings of Dr. Weston Price, Dr. Mary Enig, and others who have studied the nutrition/health relationship in great depth. She explains the history of technology and the rapid changes that took place in the way we store, prepare, and eat our food. It is a world wide look at the genius of cultural traditions, societal changes, and political involvement (i.e. $$ talks) and how the mass production packaged food industry changed everything right under our noses. It is a thorough, but easy-to-read account closely examining the history, science, and our complex relationship with nature’s provision of real foods. I now understand there’s a lot more to consider when purchasing eggs, meat, or any food item for that matter, besides price. I’ve learned I can pay now for quality food, or pay later in health issues. Because of Nourishing Traditions I now own a herd share so I can get a regular supply of fresh, unprocessed, full-fat, delicious milk and butter from grass-fed, organically raised cows raised locally. I make soup stocks, crispy nuts, creamy yogurt and kefirs, and cultured vegetables, and appreciate the benefits these foods naturally have to offer. I buy coconut oil in gallon tubs, and I now understand that fats are not evil at all – fats are complex substances that are crucial for a healthy brain and nervous system, and they are worth learning about. I’ve come a long way from getting my health information from mainstream advertisements and “experts.” I have my son’s “autism” to thank for opening my eyes to the importance and complexity of relationships that we all seem to take for granted. Nourishing Traditions shows just how significant and complex the relationship between food, the earth, and our bodies really is…a relationship that has my full respect. Books by Tara is a participant in the Amazon Services LLC Associates Program, an affiliate advertising program designed to provide a means for sites to earn advertising fees by advertising and linking to Amazon.com.